You know the drill – each month, we share a beer that we think you oughta pick up. We've been working with a local bottle shop to select a beer that's seasonably appropriate, accessible, not too harsh on the wallet, and might even impress your friends. Festival season is in full swing and that means summer has arrived in Chicago. We've picked a beer for July that will quench your thirst on those hot summer days. Evanston, IL, home of Temperance Beer Co hasn't always been a home to the craft beer movement. 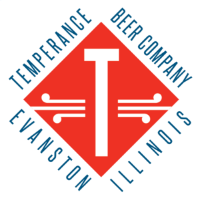 In fact, when Temperance opened their doors, they were the first to do so in Evanston since the prohibition era. Since then, Brewster Claudia Jendron and team have been cranking out amazing beers including a GABF silver medal winner for Gatecrasher, an English IPA. We're sure they'll be taking home a bunch more medals in the near future. For July we decided to go with Greenwood Beach a blonde ale with pineapple. This beer is perfect for taking to BBQs, the beach, your back porch or pretty much anywhere. Take a look at the specs below. You can pick up Temperance Greenwood Beach at Bottles & Cans (4109 N. Lincoln Ave.) in Northcenter. If ya get to Bottles & Cans, ask for other recommendations from owners Joe and Carly or any of the other knowledgeable staff on hand. And tell 'em we say hey! If you are looking for summer in a can, look no further than Greenwood Beach. This beer embodies everything that is summer. Poured into a glass its golden orange hue is reminiscent of a summer sunset capped off with a few inches of fluffy foam. As it settled down in the glass, aromas of sweet grain and tropical fruit filled the air. An ever so subtle hint of pineapple did come through but was by no means overpowering. As this one rolled across the tongue, there was a light bready or crackery taste that blended nicely with the fruitiness from the pineapple. The flavor profile resembles that of a hoppy session beer but is a little sweeter due to the fruit addition. Overall, this is a a great beer that pairs well with all your summer activities.